You can buy this as a bare-bones kit elsewhere on the site and add whatever wire length and element you want. 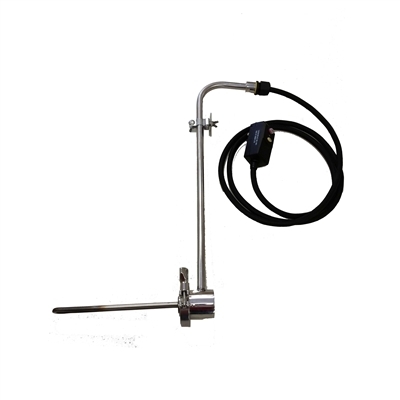 This particular item is a ready to plug in heat source that is fully prewired for you with the features most commonly requested. It includes the bare bones hotrod hardware, an element (choice in dropdown), 12 feet of 14/3 SJEOOW cable (or 12/3 if you choose the 2200 watt option), and a plug (choice in dropdown). *Please note that if you plan to use a temperature controller of any kind that will interrupt power to the hot rod, you should use a standard plug on the Hot Rod and plug the controller into a GFCI protected outlet. It his not recommended to constantly make and break power *through* a GFCI plug. If you would like to add additional footage of the 14/3 cable, add it as a separate line item and note in comments to add that additional length to the hotrod. If you select the 2200 watt element, please note that any additional cable must be the 12/3 type. Vertical conduit bend options: Left straight, you get about 28" of overall height. This option only needs to used if you have a very deep pot. The most common option is the 90 degree bend. This allows for less strain on the cord but the max pot depth (if you want it to nearly sit on the bottom) is 23". Finally, if your pot is only about 19" tall, you can opt for the 170 degree bend which will loop you over the pot wall like a Sheppard's hook and make the wire drop straight down. If you are using this in addition to a flame under your pot, the 90 degree bend gives you the best clearance to keep the wire away. Plug type: Standard plug is just a 15 amp 3-prong plug that will fit any standard outlet. If you choose this option, we HIGHLY recommend that you confirm that the outlet you will use regularly is GFCI protected (the ones with the test/reset buttons). The other option is to have us equip the hotrod with a GFCI protected plug. This will protect you from potential shock regardless of the outlet type you plug into. Element wattage. You have a choice between a LWD 1500 watt and a ULWD 1650 watt element, both of which will run on a typical 120 volt / 15 amp household circuit. The 1650 has a slightly less chance of scorching wort while putting out 10% more power. One additional choice we have added is a LWD 2200 watt element but keep in mind if you select this, you must select the 20 amp plug in the "plug type" dropdown menu. This option requires that you already have a 120 volt / 20 amp circuit available and that it already have a GFCI protected receptacle installed. Be sure you know what you have to work with before purchasing this option. The minimum pot width for this unit is 11.5". It WILL fit the Grainfather, Mash N Boil, etc. 1. 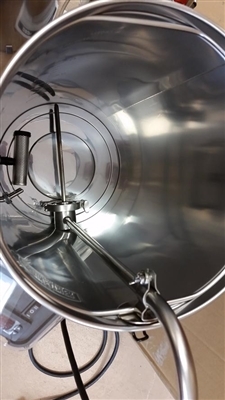 Have you heard of anyone using this on a grainfather? Grainfather users are my top customer base for the hot rod. The 90 degree bend works great. 2. How much faster will the water heat? The stock 1600watt heater in the GF takes 60 minutes to take 7 gallons of water from 70f to 158F. With the addition of the 1500 watt Hot Rods, it will reduce it to 30 minutes. Similarly, when you pull the grain and start ramping to a boil, the ramp will take 18 minutes instead of 35. 3. How do I control the boil? Once you hit boil, instead of running the grainfather on the higher 1600 watt setting, it's best to let the hotrod run at full power and then switch the GF into mash mode which only adds 500 watts but the combined 2000 is about right for a decent rolling boil. 4. Can I plug the Hot Rod into the same outlet as the Grainfather? Absolutely not. The GF and Hot Rod both require a 15 amp circuit that is not already being used for other appliances at the same time. Plugging them both in to the same circuit will trip your circuit breaker almost immediately. The easiest way to figure out if two receptacles are on the same circuit is to plug a radio in to your intended location, turn it up loud and then flip breakers off until the sound stops. Then go hunting to find the nearest receptacle that is still on. Very happy with my purchase and the overall quality of the transaction considering it was shipped to Canada. It's a nice addition to my setup in terms of time saving but also because it's adding the power I needed to get a strong rolling boil. It's not cheap of course but I think you get what you pay for as it is a robust and well designed stainless steel item. Cheers ! Did my first brew with my HotRod today. I could not be more happy with my purchase. It does not only looks good and shiny, it works just as well! My only regret was hesitating/delaying before buying it. Must have for grainfather users. Incredible rolling boil and time saver. Also great customer service. Brewhardware answered some questions I had in a timely manner. Great product and great customer service. I use this currently to heat my sparge water and to supplement the weak boil I get with my Grainfather in the US. This is amazing, just remember you need to run it on a separate circuit from the Grainfather! This heat stick shipped increadibly fast, works like a champ, and shaved over half an hour off my brew day in the grainfather. Was a breeze to put together and gave a much stronger boil than im used to. Great product.